#96 Spin The Butterfly Wheel with the Letter N.
Welcome back to the new style/format Butterfly Challenge. Thank you all for playing along with the last challenge. 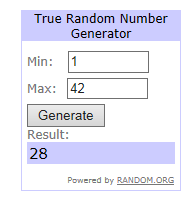 There were 64 entries so please keep them coming. Winners results for #95 are in the post below. Make sure you check back as it could be you. No one claimed their prizes on the last challenge. There are 3 prizes for this challenge. then you can either choose a Theme or a Colour from the wheel to enter for the 1st Prize. you will also be entered into the 2nd Prize. If you manage to use all 7 elements of the wheel then you will also be entered into a 3rd Prize. My First card. Using Butterfly/Naples Yellow/ Not Square. Please go to my blog here for further details on how it was made. 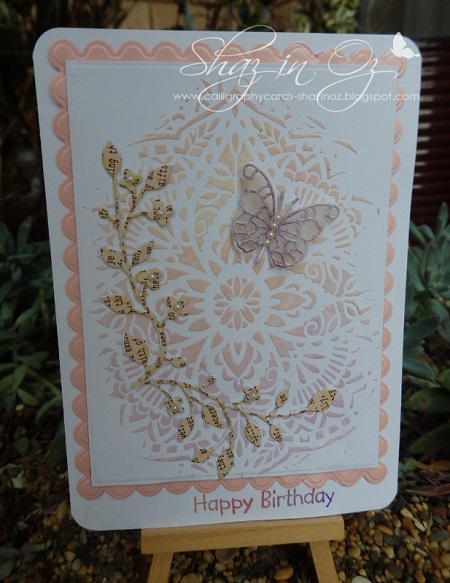 Second Card Using Butterfly/Napier Green/Numbers. I wonder if anyone can use all seven elements of the wheel for their card. Thank you for playing along in the last challenge. 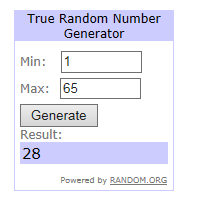 There were 64 entries (1 entry was duplicated and not included in the count ) but I left it in as removing would have resulted in subsequent players numbers being out of sync. I'm so chuffed that you all seem to like the new format of Spin the Butterfly Wheel. Shaz managed to get all 7 elements on this pretty composition. I loved the pink/purple element on this card and the shadow stamping . Just loved this gorgeous box framed destined for Mothers Day. Hope to see you all back in # 96. #95 Spin The Butterfly Wheel with the letter P.
Welcome back to the new style/format Butterfly Challenge. Thank you all for responding and playing along with the last challenge. I would hate to have to close it due to lack of interest. Winners results for #94 are in the post below. Please make sure you check back as it could be you. 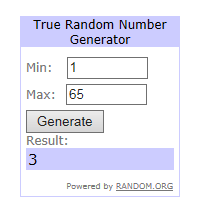 There are 3 winners this time. to make running the challenge easier for me. Please note there is no R in the word Piecing so I do not want to see any stab wounds on your creations!! First card. Using Butterfly/Peach/ Pearls. Second Card. 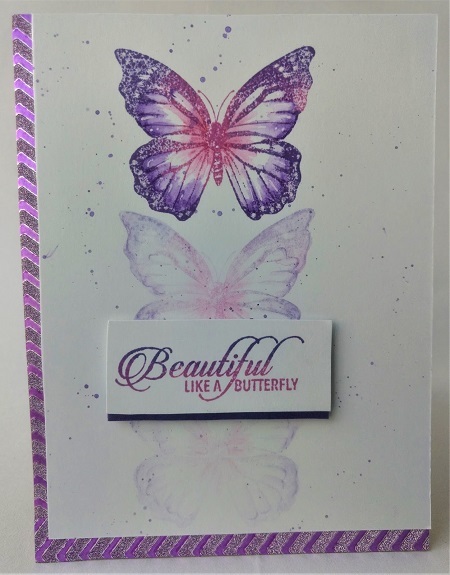 Using Butterflies/Purple/Patterned Papers. Please go to my blog here for further details on how they were made. Santoro 'Apples' Embossing Folder + Little Claire clear Butterfly stamp. Leonie Pujol 'Tangled Tails' Stamp set. I have now added another prize. Thank you for your encouraging comments and feedback on my continuing with this challenge. There were 42 players joined in for the new format of Spin the Butterfly Wheel which you all seemed to like the idea of. It was nice to see so many of you playing along. I loved the painted floral centre piece. 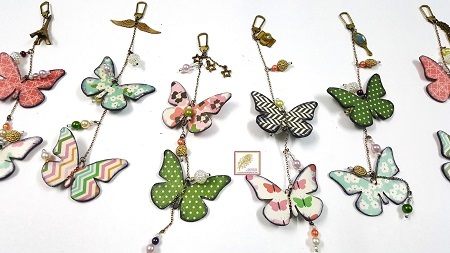 Superb mixed media made into Butterfly Charms with the colours used too. 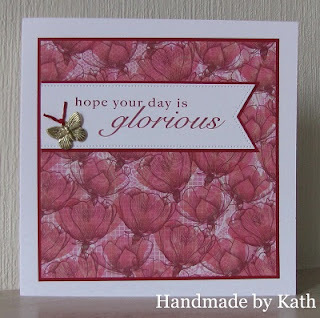 I kept coming back to Kath's card with that oh so subtle check background. using Checks and the colour Cornflower + a smidgen of Crimson. The only one missing was a charm. 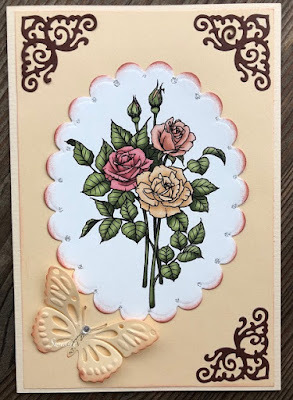 Pam please get in touch using the email in the sidebar if you would like to receive a goodie bag of Butterfly embellishemts.